Charlie is a 3 year old Labrador Retriever. He is obedience trained to sit, down, stay, come, heel, wait, and is kennel trained. Charlie enjoys playing fetch with his favorite squeaky tennis balls, playing the “find it game” to discover a hidden toy, or going for walks where he can sniff his heart out. One of Charlie’s best qualifies is that he gets tired quickly, which means that it only takes one good play session a day to ensure this guy is ready to relax with his bone. 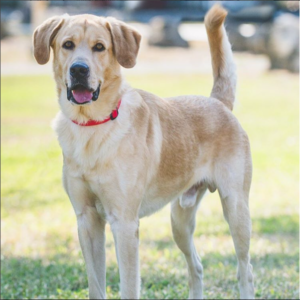 Charlie is a versatile dog that can live an active life with an active person, or can be the perfect condo or apartment dog for someone who who works long hours but enjoys jogging, biking or other exercise outdoors. Charlie is quite adaptable, which is what makes him a great companion. So whether you live in an apartment or have a house with a yard, Charlie is ready to come show you what a well trained boy he is. Oh, and if swimming is on the agenda, he’s totally down for that too! Charlie is fostered in Miami. If you are interested in adopting please go to www.lrrof.org NOW and fill out and application. To apply to adopt from Labrador Retriever Rescue of Florida, please visit our website at http://www.lrrof.org and click on How to Apply. Your support, both through adoption and donation is always essential to us and our Labs. Donate today. We’re about matching the right dog with the right family! All applicants will be assigned an Adoption Counselor who will act as their liaison. In addition, a phone interview, home inspection and vet reference (if applicable) are required for eligibility to adopt from Labrador Retriever Rescue of Florida.